Everyone has heard of the Red Arrows. Everyone is in constant awe whenever they see the Arrows perform. 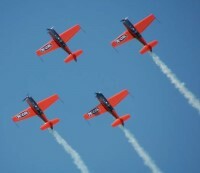 Some people even close their eyes at some of the aerobatic stunts that are performed. But, no one thought they could ever fly with them...until now. The Blades Formation Aerobatic Display Team is the only full-time civilian formation aerobatic Team in the country; Invite your guests to enjoy an unforgettable once in a lifetime experience with our world-class, ex-Royal Air Force display team and front-line pilots. You'll be able to fly in the front seat of our outstanding, high-performance Extra 300 LP aircraft, which has been specially designed for the needs of our passengers and is certified to fly anywhere in the world. Taking off in formation you'll be able to fly formation aerobatics just feet away from other aircraft, performing manoeuvres that most people in the RAF have never even done before. We tailor each sortie to your personal limits to make this outstanding experience unforgettable. Flying with the world's only four-ship aerobatic airline is an unforgettable experience. You can loop and roll in formation with clients and colleagues just feet away. 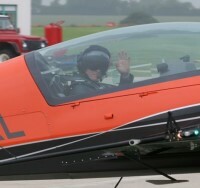 You'll be in the front seat of an aircraft that is the choice of champions with a former Red Arrows pilot giving you the ride of a lifetime. Cement partnerships, meet new clients or reward sales performances, whatever your requirements you will be left buzzing, tired and exhilarated. The facilities at Sywell Aerodrome in Northamptonshire are first class. All your guests are impeccably looked after with fine wine and luxurious food served by air hostesses (all of whom have been trained by the major airlines). There are 16 permanent cameras on board the aircraft that capture every sortie undertaken. These images can be down-linked in real time to large screens below, mobile phones, the web or TV sets. And personalized DVD's can also be made of each sortie. We normally work on a corporate guest list of 12 to 24, but larger groups can be easily hosted. The only difference would be the particular facility used (Hangar One, Two or the Tiger House) and how many aircraft and pilots we use.